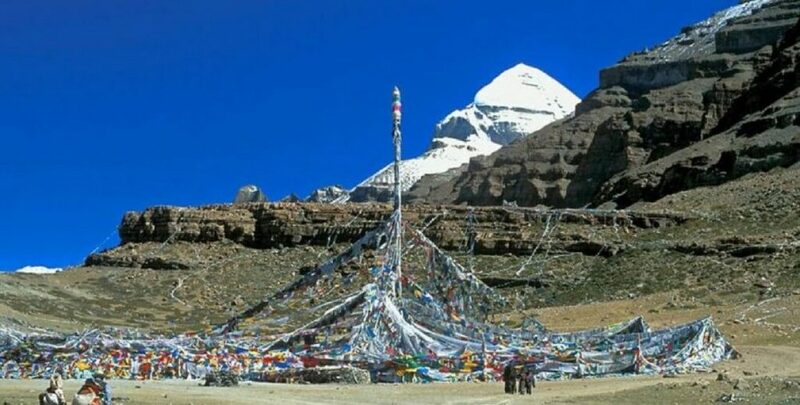 Mount kailash circuit trekking stunningly beautiful with panoramic views of the Himalaya and holy mountain Kailash. Tibet, on the lofty Tibetan Plateau on the northern side of the Himalayas, is an autonomous region of China. It’s also known as the “Roof of the World” for its towering peaks of mountain. It shares northern small part of Mt. Everest with Nepal. 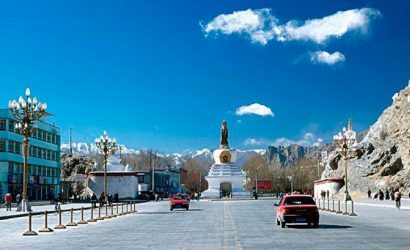 Its capital, Lhasa, is site of hilltop Potala Palace, once the Dalai Lama’s winter home, and Jokhang Temple, Tibet’s spiritual heart, revered for its golden statue of the young Buddha. 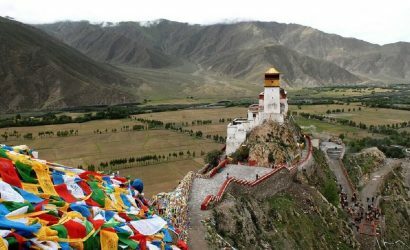 Tibet tour with mount kailash trekking leads you to the Mount kailash via mansarover lake is recognized as the lofty mountain in the world, and the center of the world by Hinduism, Tibetan Buddhism, Bon – native religion in Tibet and Jainism. At 6656 meters above sea level, Mt. Kailash, shaped like a pyramid, is the main peak of Gangdise Range with symmetrical sides. Historically, there used to have many Chinese and foreign monks preaching in there. Thus, it became the center of worship for four sects a long time ago, including Buddhism, Hinduism, Jainism and Bon, which is also the Mount Olympus in the east, a fascinated place for tens of thousands pilgrims of china, Nepal, Bhutan and India. Welcome to the roof of the world. Your Tibet journey starts with a warm Tibetan style greeting from our tibetian tour guide representative from Eagle Eye treks and Expedition.who will present you with Hada (traditional Tibetan scarves). Then be escorted to your hotel in Lhasa city at the comfort of your own private vehicle. For most of the way, you would follow the Kyichu River and then see Tibetan homes with their trapezoid shaped windows and fluttering prayer flags and Tibetans walking beside the roads wearing their distinctive national costumes. You can have a comfort stop near Nietang Buddha where a giant statue of Buddha has been carved out of a stone cliff-face centuries ago and then stay at the hotel after arrival for adapting to the high attitude. It is helpful to take things easy for the first few days and try to drink some water. After breakfast, we starts our sightseeing guided by Eagle Eye representative guide .we go to the Potala Palace, a golden feather upon the roof of the world, which Tibetans proudly claim to be the prime miracle since the creation of this world. With the golden roof shinning in the sun, it is visible from any distance. You can spend one hour wondering around the inside of this magnificent building and exploring the rooms previously used by the Dalai Lama and the many Buddhist icons within. In the afternoon we go inside of the Jokhang. Then stroll around the back alleys of the Barkhor area of Old Lhasa. The streets smelled of yak butter and incense while hordes of pilgrims shuffled along the main Kora (circumambulations) around Jokhang Temple. If someone just walked at a normal pace, one kora would take about 15-20 minutes. In the morning have a tour for Drepung monastery , the ever largest monastery with more than 10 thousand monks, Buddhist debates often occur there. Seen from afar, its grand, white construction gives the monastery the appearance of a heap of rice. As such, it was given its name which, in the Tibetan language, means Monastery of Collecting-Rice. Learn about the lives of Tibetan monks there. In the afternoon, you can tour around Sera Monastery and have a little hike for the beautiful valley scenery nearby and picnic there. Sera monastery was created in 1419 and has always been an important Buddhist seminary. As rose are planted everywhere in the monastery, it is also called “the court of wild rose”. Today still 200 lamas live in there. Catch the famous debate session of the monks before returning back to Lhasa. This day we make permit and drive to Samye monstery and in afternoon we will reach samya monastery and we visit Samye monsatery then after we make kora for Hipuri holy mountain. After fully exploring Lhasa, you’ll have a chance to get lost in the endless Tibetan landscape while you take a short hike along the turquoise waters of Lake Yamdrok, one of the four holy lakes in Tibet. This dazzling lake is normally first seen from the summit of the Kamba-la (4700m). The lake lies several hundred metres below the road, and it is shaped like a coiling scorpion. Far in the distance is the huge massif of Mt. Nojin Kangstsang (7191m). 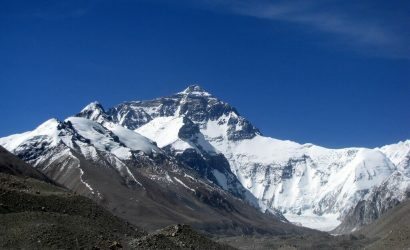 Afterwards passing by the 5,010 m high Karo-la and the Simi La forward to Gyantse (3,950m). Visit Pelkor Monastery as well as the splendid Kumbum Stupa (100-Thousand-Buddha Pagoda) nearby, both of them built in the15th century and situated in the northwestern edge of Gyantse. In the afternoon drive about 90 kilometers to Shigatse (3880m), the second largest city with 40,000 inhabitants in Tibet and the traditional capital of the Tsang. This morning you’ll have a chance to visit Tashilunpo Monastery, the home of the Panchen Lama, which is essentially a walled town with cobbled and twisting lanes that revolve around a magnificent monastery. Then we will drive to Saga via Lhatse and Sang sang, pass several lakes, towns and high plateau nomadic sites. In Saga, you will find a number of Indian pilgrimages heading toward Mt. Kailash. Overnight in Saga. From Saga it is 145 km to Zhongba, the road is good and there is also a small monastery at the western end of town on a hill. From Zhongba onwards the southern road deteriorates. There is also danger of vehicles getting stuck. But this section of the road has panoramic views of mountains on either side of the road. There will be several river crossings and we drive past Mayum la pass (4600 M) from Paryang to Lake Manasarovar. The scenery is stunningly beautiful with panoramic views of the Himalayas. In the morning, you can hike around the lake and take pictures of Mt. Kailash in distance. Lake Manasarovar is one of the holiest lakes in Tibet which cover 400km sq. Lake is devoted by billions of buddhists and hindus. In the afternoon, drive forward to Darchen, the main gateway and the village in front of Mt. Kailash. At Darchen, accommodations are very simple and basic. You can relax and rest and prepare for next day trekking. The guide will help you organize yaks or ponies for the Kailash circuit trek at Darchen. And Darchen is also the Point of Exit to the Sacred Mount Kailash (Kang Rimpoche) for the Kailash Pilgrimage Circuit (Kailash Kora). Overnight in Darchen. Start the Kailash circuit trekking with your tibetian guide today, this kora covers 53 kms and can be done in 3 days. We head west in clockwise direction. Only 4 kilometers from Darchen the trail climbs up over the southwest end of the ridge to reach a cairn (4,730m). Then, the trail bends around to north to the Tarboche flagpole. The flagpole is replaced each year at the Saga Dawa festival. After passing the Lha-chu valley, we arrive in Chuku monastery where we can have a break. Another 3 hours' trek along the river, we hit our first day’s stop, the Dirapuk monastery. Trek along Drolma Chu and reach the Jarok Donkhang (5,210m). A little while, Shiva-tsal (5,330m) comes in front. It is a rocky expanse dotted with stone cairns draped with items of clothing. Our next challenge is to get over Drolma La Pass (5,630m), the highest point of the entire kora, where you can look south for your last glimpse of the north face of Kailsh. After the ascent, we are experiencing a steep descent. Almost immediately, Gauri Kund Lake comes into view. Finally, after a long valley and river, we reach our second day’s stop, the Zutulpuk monastery. The final day’s walk begins with the easy stroll down to where the river emerges onto the plain. The valley narrows and the prayer flags flutter across the river. There is a rough road from here back to Darchen and it’s less than an hour’s walk, passing many mani walls embellished with yak skulls. Finally, our kora end up at Darchen, then drive to Tirthapuri to have a rest. Today we will start our long drive back to Saga. It is same way drive back to Saga and it is long way drive from Darchen to Saga 530KM it takes 8 hours. Today we will drive from Saga to Shigatse along with the beautiful roads of tibet. It is same way drive back to Shigatse and it is long way drive from Saga to Shigatse there is 450 KM it takes 6 to 7 hours. It is same way drive back to Lhasa and it is long way drive from Shigatse to Lhasa 280 KM is to take 5 hours .happy shopping hours and rest day after a long drive .For some hours you can explore Lhasa yourself. Day to fly back to your destination, say Namaste for memories of you Mt. Kailash trekking with exploration of Tibet that will last for lifetime. Eagle Eye Treks And Expedition representative and your trip guide will accompany you to get Airport for your departure according to your schedule flight. All entrance and permit fees for visits to monuments and museums and monastery.